Schneider Electric’s Lexium Motion Module (LMM), a programmable motion controller, is now available as a CANopen version. It supports CiA 301 and CiA 402. For CANopen motion systems with tight space constraints, the LMM’s size of 68 mm x 35 mm x 4 mm is a good solution. The controller’s CANopen interface now supports CiA 301 (CANopen Application Layer/Communication Profile) and CiA 402 (Device Profile for Drives/Motion Control). To expedite development with the CANopen LMM, a single axis development board is available. It includes isolated I/O, CAN communication transceivers, and locking pluggable connectors. The development board is available alone or as part of a complete starter kit. The kit includes a CANopen LMM, a single-axis development board, NEMA 17 frame motor with encoder, USB-to-CAN communications converter, and power supply. Complementing the 1,5-A LMM, a selection of motors is available. Options include rotary stepper motors in NEMA sizes 8 (20 mm), 11 (28 mm), 14 (36 mm) and 17 (42 mm). Custom motor sizes and styles are also available, as are controllers with alternate power levels and communication platforms. Inquiries are welcome. 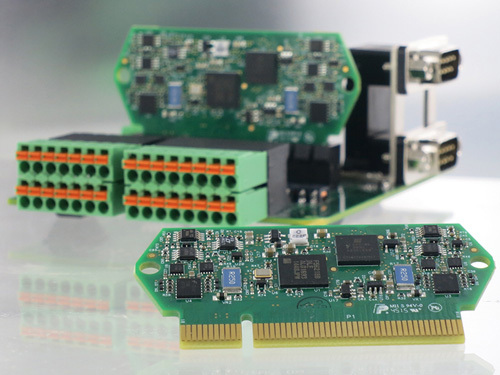 Schneider Electric provides its Lexium MDrive series with circular M12 connectors.